* Linden Labs launches Third Life within Second Life, in which the avatars of Second Life are able to create digital 3D representations of themselves, so called avatars. This is the first Third Life to be launched within Second Life. The currency of Third Life is called London dollars, which causes an uproar among English avatars. * A blog is launched in which a couple report about how they travel across the US in an RV and camp in parking lots of the PR agency Edelman PR’s offices. The blog “Edelmaneuvering Across America” turns out to be a publicity stunt by Wal-Mart with the purpose of enhancing the damaged reputation of its PR agency. * Metro, the world’s largest free newspaper, teams up with local post offices in 19 countries with the purpose of providing hyper-local news to its readers. “The mail men are already out there, visiting every house. No-one sends letters anymore, but this way they will be able to do something useful, like peak into people’s houses and report what they see. It’s a no-brainer, really”, says Christer Fingerspitzgefühl, Chief Instigator at Metro International. * Someone uploads a video to YouTube in which he reveals how you can open a cheap Bic pen using a very expensive bike lock from Kryptonite. The Bic share on the Paris stock exchange immediately plunges before a crisis communication team is able to restore confidence in the product. “We will be issuing a global replacement program shortly. Old pens can be sent to that place where pens always seem to disappear, it’s right next to the place where all second socks can be found,” says a PR spokesperson from Bic. * Mainstream media are pushing the citizen journalism trend so far that reporters are quitting their jobs in order to be just “ordinary people”. “This is the only way that I will be able to get anything printed nowadays”, says one columnist at the Spokesman-Review in Spokane, who prefer to be anonymous. 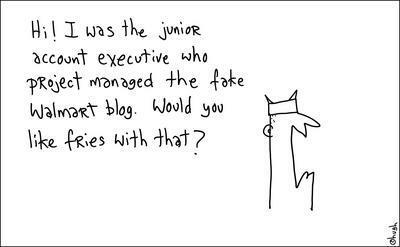 * Media Culpa initiates the third annual Swedish blog survey that shows that 102% of all bloggers write blogs about fashion and only 0.9% have nothing against being contacted by middle aged men who perform blog surveys. * Swedish “anti-Big Brother” personality Pär Ström discovers the 7 1/2 floor of his office building and finds a portal directly into the mind of former Minister of Justice Thomas Bodström. * Rupert Murdoch enters the Danish newspaper market with a new free daily which covers news and events in the Danish free paper market. Dato, 24 Timer and Nyhedsavisen are delighted that someone now is actually interested in the stories they rewrite. * Sweden’s blog princess Karolina Laika is invited to the ISS space station only to find that some of the space suits are sooo 1985. * Technorati teams up with IBM to enable grocery shoppers to read what bloggers are saying about products. A service tracks the blogosphere and delivers search results directly to the store via RFID. Sales of pickled herring immediately drop to an all-time low after an “incident” with herring and a Christmas Party is filmed and uploaded to YouTube. In the aftermath of the Working Families for Wal-Mart debacle, there has been a lot of talk about WOMMA’s code of ethics for online communications. Now PR Week writes (subscr. req.) that “Dell is becoming the largest company ever to formally adopt the Word of Mouth Marketing Association’s (WOMMA’s) code of ethics for online and blog communications”. And while we are on the Wal-Mart topic, the bad luck for Edelman doesn’t seem to come to an end. Via For Immediate Release podcast #190 I hear that when Edelman set up the organisation Working Families for Wal-Mart they didn’t register the domain with the same name. 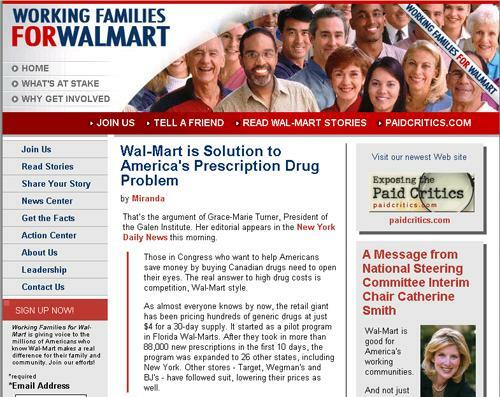 The organisation’s website can be found at www.forwalmart.com. 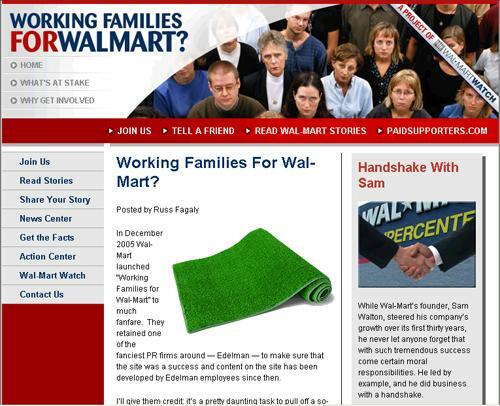 The most logical domain, www.workingfamiliesforwalmart.com, was instead kidnapped by an anti-Wal-Mart organisation that launched a pretty good parody site. Particulary worth noting is how all the smiling faces in the original are replaced by sad ones in the parody. It took a few days until Richard Edelman responded with an apology. Constantin Basturea has a good set of comments from the PR blogosphere. See also Kevin O’Keefe.